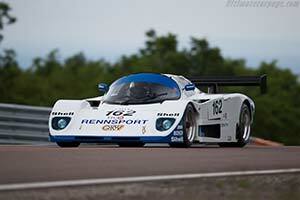 Having sat in a corner of the GKW facility, the 862SP Group C2 was eventually acquired by an Italian enthusiast. He had the car restored by GKW to full running order while the drivetrain was rebuilt by Porsche in Weissach. Following the comprehensive restoration, the car could finally make its competition debut at the 2016 Grand Prix de l'Age d'Or.